Our blog’s ongoing “On the Books” series introduces you to writers from our growing list of Fresno State MFA alumni who are getting their first books published. The fifth installment profiles Rachel Starnes. Her writing has appeared in the Colorado Review, Front Porch Journal, O Magazine, and elsewhere. 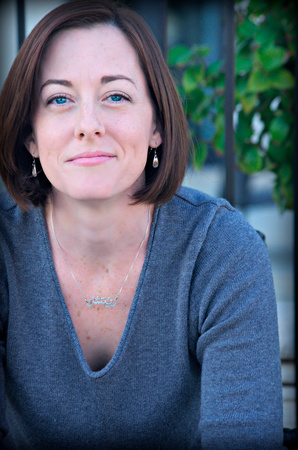 In a July phone interview, MFA communication specialist Jefferson Beavers spoke with Rachel about navigating the world of literary agents and editors for the first time, finding the right title for her new memoir despite being terrible at finding titles, and claiming her own identity beyond her nomadic life with a Navy fighter-pilot husband. When were you in the Fresno State MFA program? I was in the program from 2007 to 2010, in creative nonfiction. You worked as administrative staff for the program at the same time you were a grad student, and then you ended up staying in Fresno for a while after that, is that right? Yes, I was. I actually lucked into the program through a bit of a back door. I’m a military spouse, so of course our big challenge is finding work, figuring out what we are going to do for short periods of time in each place that we move. We are never really sure how long we are going to be in a particular place. So, the goal for me at that time in life, since we didn’t have kids, is that I really wanted to get some sort of graduate degree and I wasn’t entirely sure in what. I wanted something that was writing related, possibly. In the English Department, definitely. I initially thought I wanted to study rhetoric and composition. At the time, I had applied for several other jobs in the Central Valley. Those didn’t end up panning out. Then I applied for the staff job at Fresno State and talked to Steve Yarbrough. I submitted a writing sample and told him my kind of devious plan, to work there for a while, get my California residency, and then apply to a graduate program. Steve was very supportive of that plan. But he said, you should really be in the MFA. I thought about it, you know. That’s really what I wanted to do, creative writing, but I wasn’t sure if it was the wisest route or whatever. But you know, you can’t say no to Steve Yarbrough. So I did it, and it was wonderful. I didn’t have to wait the year. He helped me figure out how to make it work. There was a point when I was afraid we were going to get stationed somewhere else and that I would have to leave the job and leave the program with my degree unfinished. But it turned out that we got picked up by a squadron in Lemoore and we stayed there for my husband’s first fleet tour. That was a huge relief because at that point I was very invested in Fresno and I really wanted to stay. So that was great news for us. What were your first thoughts when you learned that your first book, The War at Home, would be published? Oh my gosh, I was terrified. That was actually my first thought. And then my second thought was like, YES! I was very excited. But I think the first was terrified. For me, I’m very hesitant to call something “done.” It never quite feels good enough. So, I was frightened that it would happen immediately, and I felt like the book was just not ready. Then, everything that I thought was going to happen quickly was actually the start of a very long process. Getting to know my editor, getting to know her style, getting to trust her instincts. She has beautiful instincts, and it ended up being a wonderful relationship. But it was scary at first. I wasn’t sure if she was going to take the book and be like, yeah this is great but, you know, let’s change it completely. I wasn’t sure how it was going to work at all. Was the terror factor still present as the editing process went along? Oh yes, and it’s ramping up again now. Because I’m realizing that with a memoir, with nonfiction, there’s nothing really between you and the world. I mean, you write as a narrative persona, and we talked about that a lot in the MFA program. All the different things that you can do with nonfiction. All the different things you can do within memoir. I think my narrative is pretty straightforward, the structure that I used, after having studied so many different ones. The route that I ended up choosing was pretty traditional. But still, there’s not a lot of space between me and some very private and painful and profound moments in my life, and my reader. And that’s by design. It’s really what I wanted. I did want it to be an intimate, honest book. It’s one thing to work on a thing for seven years, and it’s another thing when it’s going to come out. Let’s just say I’ll be interested to see what the reactions are. I’d like to ask you to talk more about the end of your abstract. You wrote: “My task has been to explore what it means, as a daughter, sister, and wife, but also as an American citizen, to be left behind with few answers, to sacrifice stability and peace of mind in support of those I love, and to continue to make these sacrifices in the name of our country and its causes, however flawed they might seem.” This is dated May of 2010. What is it like to hear that again, years later? And what was the process like, taking this thesis and making it your book? It definitely reflects a previous structure that I was working with. The difference between that abstract then and what the book is now is actually pretty profound. I still struggle with and grapple with all those same issues, but initially what I thought this book was going to be about was this nexus of these relationships between my father, my brother, and my husband. The similarities and differences that I perceived at the time to be kind of cause-and-effect relationships, big kinds of political themes happening. That’s where I thought my story was going to come from. My father worked in the oil industry. My brother for a brief time worked with counter-intelligence surveillance for the United States. My husband of course is a fighter pilot in the Navy. I almost wanted to take a look at all that more in the sense of a removed observer. Or at least, that was the stance I was going at it with. But the more I worked on it, and especially the more I started to work with my agent, who has flawless instincts, she really directed me to focus more on my own experience, especially the female aspects of all this. That was where the big shift happened. That piece of the original abstract focuses so much on the idea of being left behind, oftentimes in unpredictable circumstances and movable schedules. Bits and pieces, tiny snapshots of what’s actually going on in that life. The amount of information and the kind of information that you can live with on a daily basis and not get overwhelmed by the risk and the politics and all the different moving parts. Then it became much less a book about the fascinating men in my life and the ways that their jobs, you know, reflected the current cultural climate in our country, and it became a lot more about the feminine experience. Now, I think, it digs into the meatier issues that the first abstract brings up, but from a completely different perspective. It’s a perspective I was very hesitant to claim. Because as a wife and as a daughter and as a sister, in a lot of these ways – especially as a wife – I’ve felt like I’ve struggled to find my place in the community. I’ve felt at times like an outsider. I didn’t fit in. I think what I’ve found, especially now as the book is about to come out and I’m talking with more and more Navy wives, I’m finding how diverse that community is, but at the same time how much of us all struggle with many of the same issues. How we deal with it is very different. So much of what’s valued in us and what we value in ourselves is our independence and our competence and being able to keep it all together. You don’t really say publicly very often, hey, this is hard. How did you land your agent and how did that whole process work for you? One of the things I was so lucky to be a part of at Fresno State, partly from the position of my job as staff, was knowing all the events and all the things going on, the different writing conferences and opportunities. CSU Summer Arts was the first thing that I did as a grad student that was outside the program. That kind of helped me dip my toe into the world. I thought wow, this is a totally separate and great experience, and the connections that you make there are powerful. Having that experience made me a little bit bolder about setting my sights higher. Going to Bread Loaf really opened my eyes and opened up a lot of opportunities for me in terms of discovering how I would talk about my book, how to approach people about it. I’ll say all that, but at the same time I’ll say too that I never in my wildest dreams expected for things work out the way that they did. A lot of it I really do feel like was serendipitous. So, the story of how I met my agent started with David Shields. He came to read at Fresno State, and I was lucky enough to get to drive him around, make his hotel reservation, help plan his reading, and talk to him. I believe Fresno State MFA faculty Steven Church calls him the patron saint of beginning writers. And he is. David Shields will bend over backwards to help anybody because he’s curious about the world in that way. He was at Bread Loaf, and he kind of helped me start thinking about the thesis as an entire book. So when I got to the point where I was thinking, okay my thesis is done and I’m ready to start thinking about what the next step is, I checked in with him. David said okay, you need to find an agent. Here, try this guy. So I tried somebody. I was also checking in with Steve Yarbrough too, and he’d ask me how things were going. He said well, if you don’t hear back from this guy within six weeks, let me show it to my agent. But he was very careful to kind of monitor my expectations. He said, you know, I’ve done this before and it usually never works out. In this case, I was very fortunate and it did work out. The first guy lost my manuscript. [Laughs.] You know, I followed up with him. I was like, hey, just so you know, I’ll need to pull this from your consideration. I’m sorry if you’ve, you know, been pouring over it. And he wrote back with something like, who are you? [Laughs.] I was like, oh. And then he said, tell me who got it. I think I lost it, so tell me who got it. That’s how it happened. It was really exciting. Invigorating. I’ve got to say, too, that my agent was very patient. That was the beginning of a five-year relationship. My oldest son was four months old when I found my agent, and he’s five years old now. Every time I had a call with her, I was expecting it to start with, well, it has been very nice knowing you. It’s not me, it’s you. You know? [Laughs.] I truly thought at any moment that she was going to drop me. But it was very nice, of course, when that didn’t happen. She never rushed me. She never said, you know, this book is not going to be interesting in two years. That was a really pleasant part of working with her. Did you have an idea that this would be how the agent process would be, going into it? I didn’t. One of the things I found interesting about it was that I wasn’t sure how agents go about their process of vetting their writers or what they commit to. ICM is the agency I’m represented through. The way that they’ve set it up, and the way that they explained it to me from the beginning, is that they are about the relationship and not necessarily about the product. There’s no contract, so they can walk away at any time and I can walk away at any time. They’re pretty much just committing to one thing at a time. So every time I come up with something new, my understanding is – and I may be out on my own again! – they commit on a per project basis. But you do build a relationship over time. At least, I’m hoping. Can you tell me a little bit about how you got the publishing deal with Penguin Random House? I’m assuming your agent had something to do with that, right? Oh yes. The process of sending the book out was definitely a place where my agent took the lead. The way she explained it, it sounded a lot to me like applying to college. You have your A list, you know, and you shoot high. You dream big, you shoot high. Then you wait until all of those come back, and then you go on to your next list. You take it in rounds. She said, you know, don’t be surprised at all if we go several rounds. We are going to find the right fit. We are going to take our time. So we did. She was also lovely about not letting me know each time a rejection came in. Because, you know, we had our dream list and almost everybody on our dream list said no. But she was also very savvy about pitching to editors where she knew, kind of, what stuff they worked with and what they looked for. She mostly pitched to female editors too. She pitched to Sarah Stein, who became my editor at Penguin. Sarah was just transitioning over from Riverhead Books. We actually caught Sarah at a good moment in her career too. You want to have something new going into your next job, I imagine. I don’t know all the ins and outs of the publishing industry or whatever, but yeah. I think it was a great fit because, speaking to Sarah, I could tell that she had kind of an ear for this. She had an ear for the direction that it needed to go, not necessarily where it was when she first saw it. This is where the shift to the female narrative happened, having one that was about my perspective and my point of view. I also really do think that there’s a bit of moment right now where there’s a lot of excellent, really compelling literature coming out of the current U.S. military conflicts. But a lot of it is for and about the veterans themselves, people who are actually serving. Very little of it is actually from the perspective of the family or from the spouse. So I do think that I hit a moment where there needed to be something from this perspective. How did you decide on the book’s title, The War at Home? Full disclosure: I’m rotten at choosing titles. I’m absolute crap at it. I’m awful at it with essays. They end up gimmicky and just bad. Here and Gone, for my thesis, was actually a title that Steven Church helped come up with. And I thought, oh, that’s brilliant. It really represented the themes going on, and it had a great ring to it. I loved it. When the book sold, one of the first things my editor said was, we need to come up with a new title. [Laughs.] Oh my gosh, you would not believe the process that I went through on this. Pages and pages and pages. I had my mom working on it. We were trying to come up with things but it was terrible. The title is a little thing, but it’s a huge thing. It’s everything. It’s just a process that I am terrible at. I’m really fortunate that I have good people in my life helping out with it. Ultimately, my agent was pitching ideas, my editor, my mom, my dad, my brother. Everybody. It was text conversations, by committee. Which is actually how my husband and I named our sons as well, I should throw that out there. [Laughs.] When it finally came down to it, it was my editor who came up with the title. I was beating my head against the wall, trying to figure it out, and finally she just kind of slipped it in: How about The War at Home? I kind of felt like maybe she had it in her back pocket all along. But it immediately felt right and I am really excited about it. 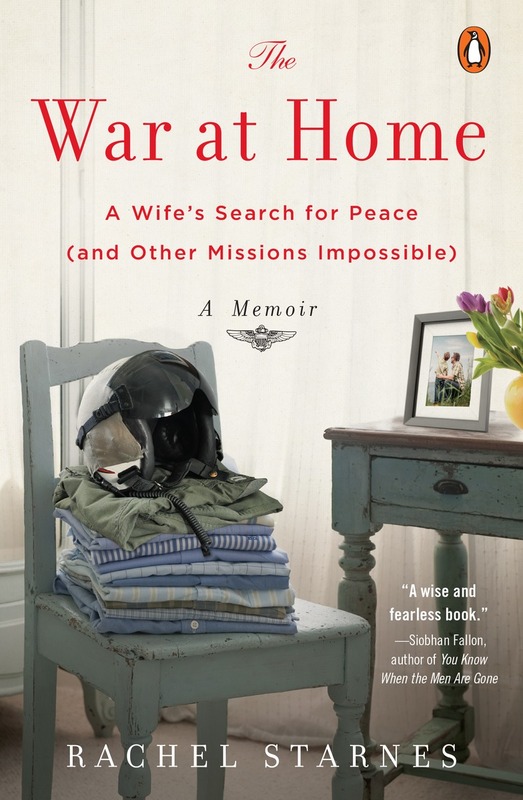 The book has a really long subtitle too, A Wife’s Search for Peace (and Other Missions Impossible): A Memoir. How did that develop? Yeah, the subtitle. Evidently, that’s what memoirs need these days, a subtitle. I had no idea. I thought “A Memoir” was a subtitle, you know? It’s like, hey, P.S., this is a memoir. But everything’s about metadata and all that kind of stuff. So I’m sure there’s a logic or a rationale behind doing this. But yes, I went around and around about the subtitle too. And again, luckily, I trusted the judgment of people who know this better than I do. Are you pleased with the subtitle, as pleased as you are with the main title? I’m pleased with the title. The subtitle, I struggle with a little bit. A wife. A wife? A wife’s search for peace. Oh, how about a woman’s search for peace? In the book, I feel like it’s a pretty constant theme, that I chafe under the feeling of not having an identity that’s separate from my husband’s. That’s hard to come by, when you are relocating as often as we do. It was a huge impetus behind me even writing the book in the first place, trying to find the through-line. We move so much. For him, it’s very obvious. He goes up in rank, you know. He has this community. He gets new skills. His job changes. It’s a very logical, linear progression as to what he has been doing over the years, and I wasn’t sure I had that. I wasn’t sure how to find out if I had that. I’ve always kind of been like, I am not Mrs. Navy Wife, as proud of my husband as I am. Outside of writing creative nonfiction, what work are you doing? I stay home with my kids, and that’s pretty full time. They’re ages five and four. They’re just about to enter that age where they’ll be gone to school. My plan, hopefully, is to really capitalize on this moment to try and get a little bit back into finding a professional role for myself. It was a conscious decision, to stay at home with them when we first had them. But that doesn’t mean that it wasn’t difficult and kind of a loss of identity. I felt housebound for a number of years. It’s absolutely the hardest job I’ve ever had and the most rewarding, but there is a sense that I want to model something for my kids where they see that the balance of power in our marriage changes over time and that we collaborate on that, and we are both able to follow our dreams. It’s not just one dream that dictates the direction of the household. I have a couple of wish lists. I’m not quite done with my love affair with creative nonfiction. But at the same time, I would really like to take the focus off of me for a while. I had some things that I kind of needed to get off my chest and bring out, and there was a story there that needed to be told, just for me to feel peaceful. I would really love to try fiction. It seems to me like it would require an entirely different writing brain than the one I’ve been working with. What are some of the books, maybe that you and your kids read together, that you all like? We love Roald Dahl. I grew up on Roald Dahl. He’s my hero. I love that he had such an interesting life. He was a fighter pilot and a spy, you know, kind of a sleazy dude for a period. But I loved how he didn’t patronize children. If it was called for, he would paint something really dark and scare the crap out of them. Twist it a little bit, and try to find something else in the world. I liked that it wasn’t always kind of twinkly and hopeful, you know. He’s dark! I like Beverly Cleary, too. I loved the Judy Blume books. Thinking back, what about your MFA experience at Fresno State has stuck with you, as you transition now to published author? I had such amazing colleagues, in the writers and in the community, and in the various workshops and literature classes that I took. I had such thoughtful fellow writers. I think it was the first time in a decade-long experience – this journey of traveling around in the Navy with my husband – that I felt like I had a community. I really fit somewhere. That was huge for me. Also, having a community that didn’t seem like it was trying to mold one particular type of writer. There was a lot of latitude to be who you needed to be. I liked as well that there was kind of this underdog feeling to Fresno. There was a lot of pride, but there was also kind of this feeling that this was a part of California that nobody really talks about so much. It was an exciting feeling, to know that there was stuff happening there and we were kind of discovering it together. When I say “Fresno writers,” what kind of feeling does that label invoke in you? You’ve got to remember that you’re asking pretty much a nomad. I looked at Fresno, and I look at places now, where we’ve traveled and where we’ve lived, and I look at them all through the eyes of someone who’s not going to be there permanently. There’s a lot that you’re willing to put up with, in terms of relative comfort, in order to come up with an interesting experience. The other thing is, the particular sub-community that we’re a part of in the Navy, tactical aviation, it’s loud and it’s noisy. There’s not a lot of really big cities that want us nearby. So, you tend to find a representation of America that you don’t see much in literature. At least, I don’t feel like I have. That was exciting for me. This is not New York that we’re talking about. This is not L.A. This is not a really big city. Consequently, I think you see a lot more dimension there, a lot more of an interesting set of people going around that aren’t so fully conscious of, oh I’m in the coolest place or whatever. That’s not a dig at Fresno at all. I hope it doesn’t come off that way, because it’s not. Not at all, to me, as a Central Valley native. Fresno was a genuinely interesting place to be, in a way that most places that bill themselves as interesting or as desirable locations are not.